Ms. Galactopus sat at home, waiting for her husband to return from earth with food for their children (and by food I mean delicious humans). Earth is very far from Galactopia, and they have A LOT of children, so she knew the wait would be long. But this has been too long. Something happened to her husband on earth, and now she's going there to find out what. Given our history with Galactopuses, we aren't going to let another one just casually stroll into our atmosphere. We've built a defense shield around the entire planet and stationed a squadron of our best fighter pilots around the perimeter. As one of those pilots, your mission is to drive Ms. Galactopus away from earth with you laser blasts. Keep an eye on her babies. They can't hurt your ship, but they weaken the defense shield if they collide with it. Shield strength is indicated by the color of the shield (darker = stronger). If a baby breaks through, it's GAME OVER! April 7 2019: Posted the FINAL version of the game (barring any bugs that need to be fixed). Use the left joystick to move your ship left and right. Press the button to fire a laser blast. Left Difficulty B: Pressing the button resets your shot. Left Difficulty A: You must wait for your shot to clear the screen before firing again. Right Difficulty B: Your shot can destroy a baby even if it is overlapping your ship. Right Difficulty A: Shots only harm babies if they are higher than your ship. Edited by KaeruYojimbo, Sun Apr 7, 2019 12:47 PM. Very cool!! Ms. Galactopus looks great!! Edited by neotokeo2001, Sun Oct 16, 2016 11:57 AM. A few little updates. Added some sound, scoring and end of level bonuses. With each new level, Ms. Galactopus starts a little closer to the player but other than that it doesn't get any harder yet. Thanks! Glad people are liking it! It's been a few months, but I'm back to work on Ms. Galactopus. Most of the changes since the last post are under the hood, but I did add a death scene for Ms. G and fixed the animation of the babies. Hopefully I'll be able to focus on the game again and keep updating regularly. It's already a very cool game. My only disappointment is that the babies are unaffected if you hit them while they are still moving with the Ms. I thought that the game would be too easy if you could blast the babies any time, but it doesn't seem to make much difference. Try it out and let me know what you think. i think I like the babies acting as a shield until they drop. Increases the challenge dramatically for me. Otherwise, this quickly becomes a mindless shooter. I guess it depends on how you want to play. You can just blast away, but if you want a good score, you need to focus on Ms. G.
Each level has a set number of babies worth 15 points each. If you kill all of them, you get a bonus of 25 points per level of shield remaining. But, if you kill Ms. G, your bonus is 25 x the number of babies left x the level of shield left and you replenish a level of shield of you have less than the max. So it still pays to go after Ms. G rather than the babies. It might even be a little harder this way since it's possible to accidentally take out a baby still at the top of the screen and cost yourself bonus points. Is this a new game or just a graphical update of Galactopus? That is a great game indeed. The gameplay is different. I mean, it's still a vertical shooter with a giant space octopus at the top of the screen, but other than that it's different. I haven't had as much time to work on it as I would like, but I have every intention of finishing it at some point. I downloaded both May 25th ROMs, gonna put them on my Harmony later. I tried the "b" ROM the other night. 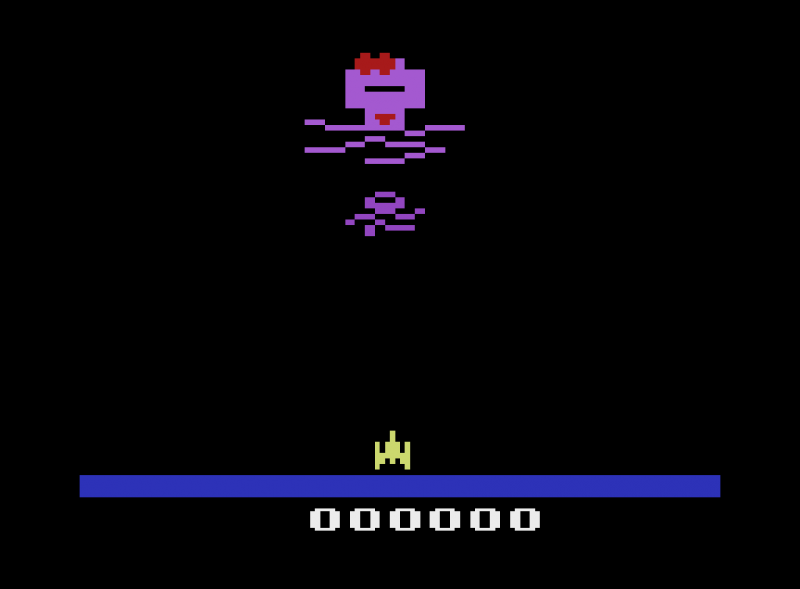 It was quite a fun game until I let one of the baby octopi hit the ground while I was shooting the mom. It froze when the baby hit the ground. I'll play it some more and if it happens again, I'll take a pic of the screen. So far it's a really fun title and I like shooting the babies. It was quite a fun game until I let one of the baby octopi hit the ground while I was shooting the mom. It froze when the baby hit the ground. I'll play it some more and if it happens again, I'll take a pic of the screen. The game freezes when a baby makes it past and there's no shield left, so that's probably what happened. I'll add a lot of flashing colors to the next update as a stand in until I do a real game over sequence. I'll add a lot of flashing colors to the next update as a stand in until I do a real game over sequence. That's the only thing this game is missing. I couldn't put my finger on it, but now that you've said it, that is EXACTLY what it needs. The freeze is a bit of a pain playing on Harmony since all joystick and console inputs are frozen, I gotta power off the Atari and find the ROM again in the menu. But I understand you plan to implement a Game Over to fix this. Another suggestion, since the bullets travel so slowly and there's only one onscreen at a time, sometimes I gotta shoot that baby NOW before it hits bottom. Perhaps a reset function on the one bullet would help, ie pressing fire again resets the location of the bullet to the end of your gun. I seen some Atari games that do this, and once you tame the urge to button mash, it can be quite resourceful to fire a second bullet once you are sure the first will miss it's target. Having one bullet onscreen at a time makes firing very strategic in this game, but perhaps a difficulty switch could decide whether to reset the bullet or wait it out. This gameplay is quite clever and solid as is. Another addend that would make this game more awesome: paaaddlessss! I considered resetting missiles (I've always called them Gorf missiles. I don't know if Gorf was the first game to use them, but it's the game I associate most with them.) but decided against it. I like the idea of making it an option with the difficulty switch though. The batari basic multisprite kernel doesn't have support for paddles, so even if I wanted to include paddle control I couldn't. I know people go apesh*t over paddles for side-to-side shooters, but I think it upsets the gameplay balance too much unless it's something like Astrosmash or maybe Spider Fighter. Edited by KaeruYojimbo, Tue Jul 25, 2017 9:53 AM. A couple of little additions. First, the reset switch restarts the game after it freezes. Second, the right difficulty switch now gives you resetting missiles in B, non-resetting in A. Added a couple of sounds, but the main update here is that starting with wave 7 whenever you shoot a baby still traveling with Ms. G it gets another hit point (up to 4). Edited by KaeruYojimbo, Thu Aug 10, 2017 10:14 AM. Great game! I had said this about Galactopus the First in a recent review, but I think it would be awesome towards the end if one should have to face off against multiple galactopuses. Like either Ms. Galactopus and her sister or Mr and Mrs Galactopus, reunited. Now with Bonus Stage! Crappy, half finished bonus stage that needs a lot of work, but still a bonus stage!